All Stainless Steel exterior and/or interior available on all Nelson Dipping Cabinets. Many other custom options also available. Call for details. 1 Year warranty on parts and labor for all Nelson Equipment, 5 Year warranty on compressor, insulation, tubing. Extended compressor warranty also available. Our ice cream cabinets are also available with raised-bottom freezers for those operators who do not use the lower step in a conventional freezer. The cabinets can be made with optional dry storage in the lower area. 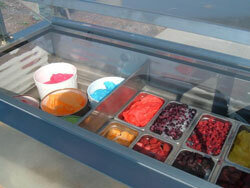 Operationally, there is no need to have empty tubs or milk crates or whatever to raise your ice cream containers. And no lower area to clean or pay to refrigerate if you don't ever use. And you don't have to bend over so far. My back feels better already. Galvanized steel interior, Optional 22 ga. 304 stainless steel exterior and 24 ga. stainless steel interior. Now Nelson offers a complete line of visual dipping cabinets from 4 to 16 facings, with a clean line, nearly unbreakable lift lids and complete with optional can racking systems. All standard with Nelson's exceptional quality. We make more sizes of flavorrail cabinets than any other manufacturer, with the deals in the ice cream industry found online. While these use a cold wall refrigeration system, they are far less costly to buy and operate compared to a forced air gelato cabinet. So if your budget doesn't have the thousands of $$ for an imported gelato cabinet, let us help you squeeze into something more affordable and still give you a nice freezer to serve your gelato products. Call for more information and pricing on Nelson products not currently shown on our website. 1 Year warranty on parts and labor for all Nelson Equipment, 5 Year warranty on compressor, insulation, tubing. Extended compressor warranty also available.